Thank you to all the NAMA members who brought contributions for this year's silent auction, and to the Philip Hanes estate for donating an amazing collection of mycological prints and books. Due to the dedicated efforts of volunteers and member contributions, this year’s silent auction brought in what we believe is the highest total ever: more than $5,000, all of which directly benefits the NAMA Memorial Fellowship. The more we learn about Phil Hanes, the more interesting the story. Hanes was, by all reports, an extraordinary individual. He was very involved in Winston-Salem, North Carolina, as a philanthropist and supporter of the arts. He was a progressive thinker in a time before such things became popular; he helped establish the North Carolina School for the Arts in the 60s. R. Philip Hanes became interested in mushrooms around 1960 when he had surgery for tennis elbow. At that time recovery in the hospital took several days. A friend brought him a mushroom book and he memorized it and begin to search for them from that day forward. Mushrooms, along with many other things in his life, became a passion. He was elected to membership in the Mycological Society of America in August 1961. He became a member of NAMA shortly after it was founded, and may have been involved in the People-To-People Committee days. My Audition When he needed a new doctor, Hanes summoned a young internist, Richard B. Weinberg, M.D., from the Wake Forest School of Medicine, to his home for lunch. Dr. Weinberg has shared this story with us, published in the Annals of Internal Medicine*. The first course was an exotic mushroom soup, prepared by Hanes himself. Dr. Weinberg's reaction was priceless. Click on the link to read the full story. Phil Hanes also cared deeply about nature. When he visited a tract of land with a beautiful waterfall, he was horrified by how the area was being treated. 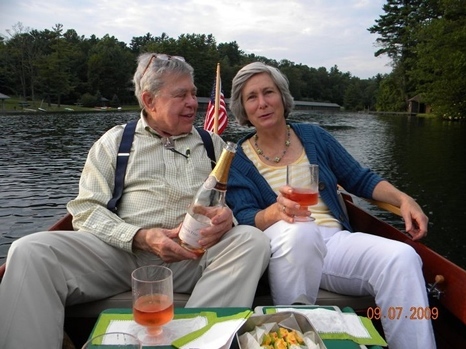 He bought the land, and donated more than 1000 acres to help establish Stone Mountain State Park (NC). He and his wife Charlotte personally acquired and protected thousands of acres of property along the New River in southwest Virginia from unwarranted development including a hydro-electric Dam in 1976. Philip and Charlotte Hanes went on many mushroom forays in the US and Europe. Charlotte Hanes shared his passion for fungi, "we loved finding and figuring them out!" They often attended the Wildacres Regional Foray as NAMA Life Members. According to NAMA's Allein Stanley, if Phil had an interest in a particular aspect of mycology, he would invite a mycologist to his home to learn more. Another story of Phil's exploits preparing soup for folks unsure about wild mushrooms is the topic of a 2002 article in the NY Times, titled "Food - Out of the Woods". I first met Phil Hanes and Charlotte at the William Chambers Coker Foray in Montreat, NC in September 1994. Since we were practically neighbors, living about an hour apart, we started getting together for numerous mushroom outings. I have many fond memories of Phil’s excitement at finding a nice fruiting of fungi. He loved the woods as much as anyone I’ve ever known. 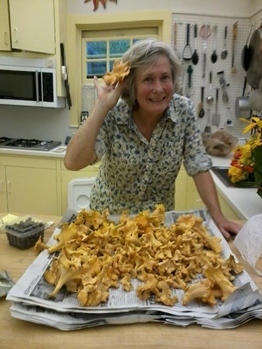 One of my favorite stories is the time Phil made an offer to my wife Cindy and me: “Take me to a good morel patch, and I’ll treat you to a lobster dinner.” We said, “Yes,” but the dinner wasn’t necessary. Phil drove up on Saturday morning and met us near one of our favorite patches here in the foothills. Soon after we got out on the trail, we started finding numerous, beautiful morels. Phil remarked that he picked more morels that day than in all of his years mushroom hunting. As we went back to our cars at lunchtime, Phil intended to make good on his promise of a lobster dinner. The problem was that there wasn’t a restaurant that served lobster for many, many miles. No problem. Phil opened up the back of his car and broke out the most elegant lobster (picnic) dinner, complete with a nice glass of wine in a real wine glass! 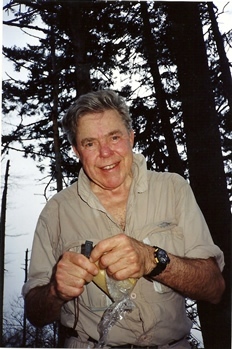 We sure miss that Phil, a fellow forager who knew how to bring together nature study and good food with lots of class! *A free link to this article from Annals of Internal Medicine is provided through November 1, 2016, courtesy of the American College of Physicians. Website users may not distribute or post this article without written permission from the American College of Physicians. Posting or distributing article PDFs not only violates our copyright, but it also could proliferate the sharing of non-authoritative versions of our articles. From Weinberg RB. My Audition. Ann Intern Med. 2014;160:872-873. © 2015 American College of Physicians. Used with permission.